Ever since the release of Ingress version 3.0.1.20 in February 2015, Ingress software has been loaded with a new feature, which is the Fire Roll Call Report. This report will show users who are still within the building during an emergency. However, do take note that this report only works if you install an In-Out reader system. Therefore, you will at least need 2 devices installed at a door, one each for entry and exit. The In-Out reader system is a system where you have records of users who enter a zone and users are required to verify their fingerprints when leaving that zone. Ingress Software constantly checks on users who are entering and leaving the zone by gathering transaction logs from these 2 readers. The report will ONLY display the user ID of any person who has not checked out from a zone. 1. How do I establish the In-Out reader system? Kindly refer to this link for more information about FingerTec models. 2. I have just purchased a TA200 Plus to use with Ingress. Will I be able to generate this report? TA200 Plus is a time attendance device. 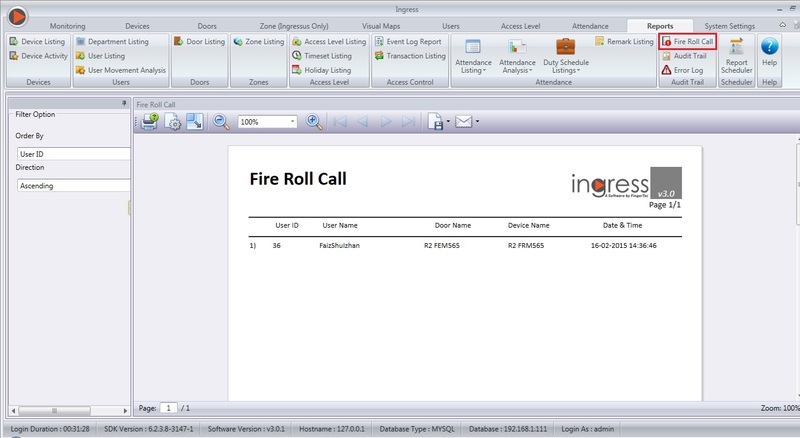 Access control devices configured with the In-Out system is required before a fire roll call report can be generated. 3. Can the fire roll call be generated and printed automatically upon an event‎? At the moment, there is no sensor to trigger a signal to the system so you will need to preview the report manually. 1. Install an In-Out reader system and in Ingress, add the devices to the designated Door. 2. Next, you must assign one device as Emergency Exit for every door. 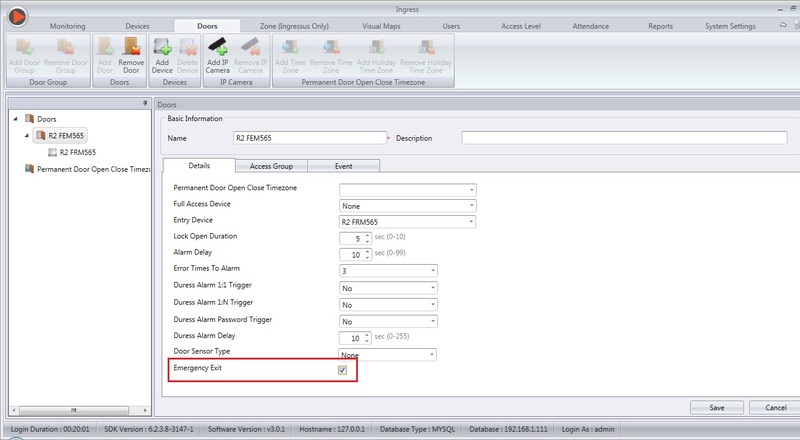 To do this, at the ‘Doors’ > ‘Details’ tab, select one of the devices as ‘Entry Device’. Following that, tick the option ‘Emergency Exit’ and click Save, then sync it with the FingerTec Terminals. Note: Ingress recognises the Entry device (as configured under Entry Device) and it takes another device (exit device) as Emergency Exit device. In case of an emergency, employees verify their departure at the Exit device to unlock door in order to leave the area. Fire Roll Call report will display the name of users, who do not exit through this door. 3. Repeat the same settings for each door (e.g Production floor, canteen, office). 4. Then, go to Reports Tab > Choose Fire Roll Call Report to view user who has not checked out from a zone.